Rapid prototype castings in high strength Inconel, cobalt chromium, titanium, copper and stainless steel alloys from RapidProtoCasting. Our rapid investment casting process combines comprehensive casting engineering, development of the best prototype casting patterns, proprietary precision investment casting processes and casting processing to deliver prototype metal parts. 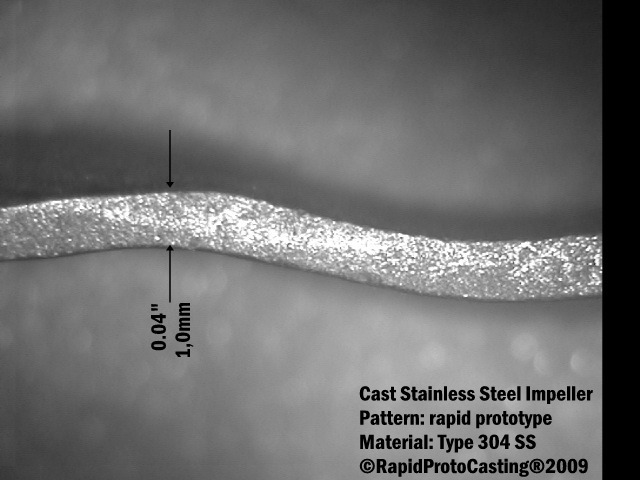 RapidProtoCasting works closely with the customer to translate a research, engineering or marketing concept into a precision fully-functional high-strength superalloy casting. 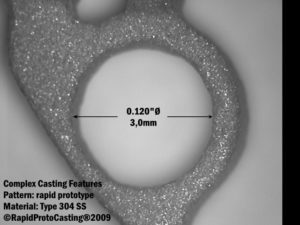 Fully defining a casting includes the final geometric and dimensional characteristics, material properties and surface finish and treatment as well as the methods for achieving, testing and inspecting these. RapidProtoCasting selects a process for manufacturing the single-use patterns for its lost-wax investment casting process. RapidProtoCasting works with the rapid prototype, machined pattern, wax injection tooling, or plastic injection tooling supplier to design the pattern. Several adjustments to the pattern design, tooling and processing may be necessary to produce complex features, very thin walls or casting designs with tight dimensional tolerances. Converting a finished casting design into a physical high-strength precision superalloy casting follows a well-defined and documented process. RapidProtoCasting has developed several proprietary casting mold designs, investment casting ceramic systems, block mould casting ceramic systems and casting processes. The best casting process will be identified to produce the required quantity of castings with the necessary dimensional, mechanical and geometric properties which meeting customer requirements for speed and target price. Precision metal prototypes convert your concepts to functional castings. Finished castings can be processed to modify the part geometry, change the mechanical properties and improve the surface condition. Following processing, castings can be inspected to verify part geometry and dimensions, internal metal condition and cast metal surface conditions.